UPSC conducts many competitive examination every years, one of the main examination which UPSC conduct is CDS Exam. 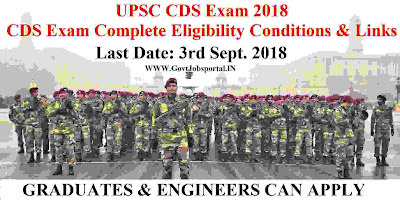 CDS Recruitment process is one of the major recruitment process for the placement of young Indian fresher candidates as an officers in Indian defence including Air-force, Navy and Army. We try to explain the complete information related to the CDS Eligibility and other term and condition in this article. 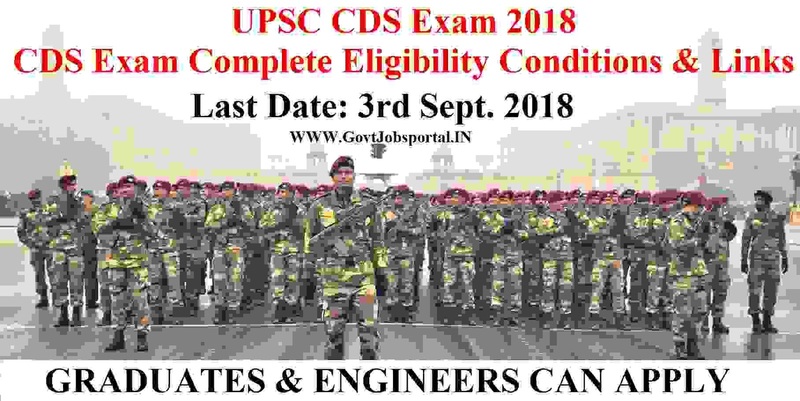 So those who want’s to serve Indian nation can apply for this CDS Recruitment process. The aspirants applying for the CDS examination should ensure that they accomplish all the suitability conditions for admission to the CDS Examination. Indian graduates in any stream/discipline from a well-known university of India are eligible to apply these Government jobs in India. More information related to this CDS Examination conducts by UPSC department is given below in this article. Read the whole article carefully before applying for this UPSC CDS Examination 2018. Number of Vacant Positions: 414 Posts. What are the various Eligibility Criteria for this UPSC Recruitment? Below we are going to explain about the various CDS eligibility conditions for applying this CDS Recruitment, which candidates should satisfied for applying particular type of course. Check the table below for more detail related to the CDS Eligibility. Having a Graduate degree can apply these posts through CDS Recruitment. Candidates must have age in between 20 to 24 years for applying this CDS Recruitment process. Engineering Degree candidates in any stream can apply for these posts. Mathematics at 12th class level can apply. What is the application fee for applying this CDS Recruitment? You can pay through the online way. The various methods are “Debit/credit card or Net Banking or challan in any branch of SBI”. What is the process for applying this CDS Recruitment 2018? Those who are satisfying all eligibility conditions which we explained above and are interested in these Government jobs can apply online. The process for applying online for this CDS Recruitment will be active on 8th Aug. 2018. The link will stay activated up to 3rd Sept. 2018. So all the eligible candidates have to apply online between these dates for this UPSC Recruitment process. Under IMPORTANT LINK Section we share the reference links as well as the link for applying online. 8TH Aug. 2018 is the Starting Date for Applying. 3rd Sept. 2018 is the Last Date for applying.